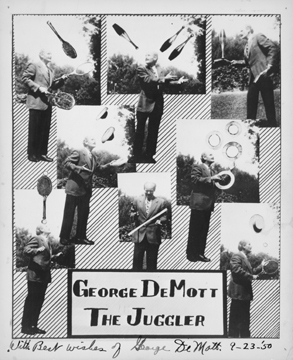 George DeMott (1907-1986) was a professional juggler, magician, and clown throughout the U.S. and Canada for 45 years, touring with circuses, in vaudeville, and for school assembly bureaus. He was the author of a book on specialty juggling technique entitled Want to Be a Juggler?, published in 1962. DeMott was a collector of showbusiness memorabilia, and both his personal scrapbooks and collection of ephemera are held in the Billy Rose Theatre Collection of the New York Public Library. George DeMott was an early member of the IJA, and co-organizer of the 1949 IJA convention in Jamestown, N.Y. The composite promo photo is inscribed "With best wishes of George DeMott, 9/23/50".